The black background behind the letters is not a fault of the picture format. I am absolutely sure you've renamed the file. So be sure to delete the "//" <-comment slashes in front of "GUILanguage, located in your main.cfg! Spica, do you plan to release a german version in the next time? I have done a complete german translation and its fully working. If you need any help, don´t hestitate to contact me! no, I don't think so. There are some problems. I have translated everything into German, but some parts of Space Engine are still in English and some parts are already in German. I would be happy, if you would release your translation. It is complete and have no problems, so I see no reason not to release it. Okay, I have no idea why only the half of your translation is shown correctly ingame. I'll pack the files and release them. Maybe you'll find what's eventually missing. Unfortunatelly some things are still hardcoded, like the visualization of numbers and its scale units. Wish I could visualize numbers comma-separated instead of using dots, as well as having the temperature shown in Celsius, as we germans are most likely used to. Here's the latest localization files (Russian) for those who want to update their translation. Completed translations will be included in 0.97 release. After today, I will make all new updates at the end of the cfg file to help you update your translations. Note that the font texture has some changes too. (replace "loc" with name of your localization). Edit: in second attachment - the Photoshop file for main menu with all layers and texts, and two fonts used in it (double click on the font file and click "install"). Remember to save in Photoshop in TGA format and then convert to PNG using SE. Thanks for the files and the instruction, SpaceEnginer! It's a nice idea to include different languages for offering a multi-lingual version. I will take a closer look into your files and try to follow your steps. I don't need a special date, just an overwiew for time management. Is there a promised deadline for the completion of the translated files? 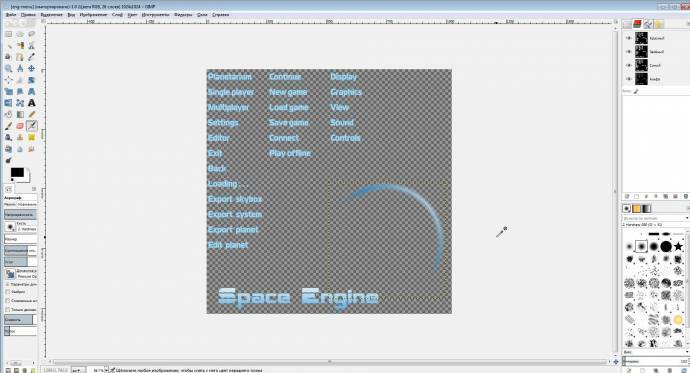 SpaceEngineer, the 0.97 menu texture is vertically flipped compared to 0.96. Is it supposed to be like this for 0.97? It is not flipped. Something wrong with your image viewer/editor. Something wrong with your image viewer/editor. GIMP, Photoshop, and Picasa Photo Viewer all display it that way. It is flipped. Strange, for me it is not flipped. Send you PSD file again (see attachment). Send you PSD file again (see attachment). No, it wasn't the PSD one that was flipped, it was the TGA that you had in the archive of 0.97 locale files. 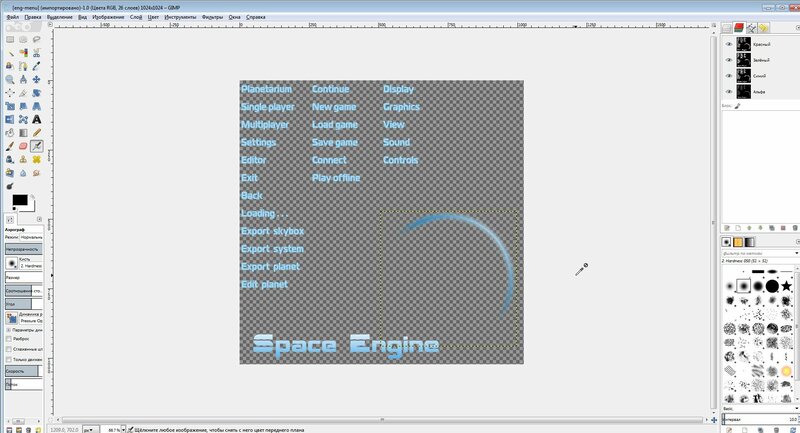 Updated menu texture, I added one new button ("Close") and made Space Engine logo with the same style as buttons, and fixed its "E" letter. It also has a hidden layer with the editable logo text itself, but to fix "E" letter I rasterized it and edited it manually. The archive also includes required fonts and a Russian menu, to give you an idea which "buttons" can have a double width (actually it is the editor buttons). After editing, the texture must be saved in png format (surprisingly, Photoshop does it well in this case). Some new buttons will be added in the future, so be ready to update your textures for other languages.